Former Pirate OF Jason Bay has reached agreement on a four-year, guaranteed $66 million contract with the New York Mets, with a vesting option year that could increase Bay's overall payout to slightly more than $80 million over five years, says ESPN. Not bad for a 22nd-round draft pick. The most Bay ever earned in a season with the Buccos? That would be $6 million, in 2008. Since pricing himself out of the Pirates' league, Bay has been acquired by Boston and the Mets, and I'm sure he will be a Yankee at some point before his career concludes. Oh, Major League Baseball, you're so predictable. Don't ever change. How have the Pirates fared since dumping Bay in 2008? If you'll remember, they acquired four pieces to their puzzle at the time: pitchers Bryan Morris and Craig Hansen, OF Brandon Moss, and 3B Andy LaRoche. Hansen was designated for assignment by the team recently, so he's off the 40-man roster. LaRoche hit .258/.330/.401 with the Pirates in 2009, with 12 HR and 64 RBI in 150 games. Moss hit .236/.304/.364 with 7 HR and 41 RBI in 133 big league games in 2009. And Morris went 4-9 with a 5.57 ERA for Lynchburg of the advanced single-A Carolina League. So to answer my question at the beginning of the paragraph, it's still a work in progress. It will be fascinating to see how Bay fares under the bright lights of New York and the expectations - some of them surely unrealistic - that come with a contract like this. I've always seen Bay as more of an extremely gifted complimentary piece rather than a centerpiece, as he was in Pittsburgh. But even with players around him making more money (e.g., Carlos Beltran, Johan Santana), Mets fans will be counting on big things from their most recent off-season splurge. On paper, this team has some serious offensive firepower, with Beltran, David Wright, Jose Reyes, etc., but the one thing none of those players can do is pitch. The Mets had one starting pitcher with an ERA under 4.00 last season, Johan Santana, and he was lost for the remainder of the 2009 season in August with surgery on his elbow. So a gaping hole remains. And besides, even if they had good pitching...they're the Mets. You and I both know that they'll find some way to screw things up. is bay going to make more than the entire pirates roster? 4 yrs... 66 milly = 16.5M/yr... so no, but close! 16Mil for one year of jaybay seems like an awful awful lot, but they wouldn't pay him if they didn't have the money... i'm in the wrong business! 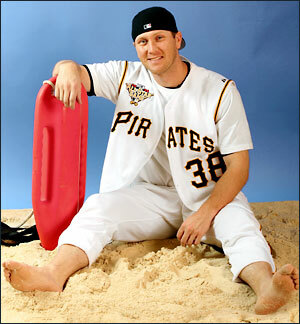 I really hope people don't boo him at PNC Park. Not that I'm a huge Bay fan to being with, but the guy has never publicly said a bad word about the Pirates and he suffered here for a long time. He deserves his pay day.